Three former Oakland Raiders are donating their brains to CTE research in order to honor Hall of Famer Kenny Stabler. 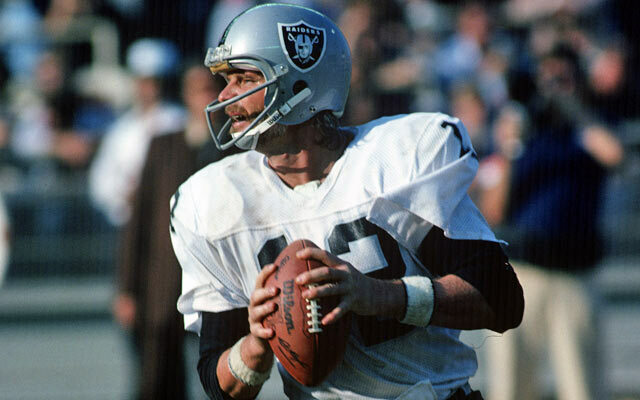 A group of former Oakland Raiders players from the 1980s are all donating their brains to CTE research in order to honor the late Kenny Stabler, they told the San Jose Mercury-News. Stabler died at the age of 69 in July 2015 after a battle with colon cancer. This past February was an up-and-down month for Stabler's family. There was good news, with Stabler finally getting inducted into the Pro Football Hall of Fame. And there was sad news, with the revelation he dealt with Stage 3 CTE. Touched by the things Stabler dealt with late in his life, George Atkinson, George Buehler and Art Thoms decided to dedicate their brains to CTE research. [The Concussion Legacy Foundation's] mission is to elevate the understanding of the causes of chronic traumatic encephalopathy, or CTE, the disease being linked to repeated blows to the head. The former Raiders made the unusual decision to speak out together as a show of solidarity for their fallen friend Stabler, whose brain showed signs of CTE. Thoms, who played defensive tackle with the Raiders for seven years, said Stabler's struggles brought the group together. "When you see your teammate deteriorate a lot through the end of his life, to see him go out like that, it brings us together," Thoms said. Atkinson, whose son is on the Raiders roster, quit doing broadcast work because of memory loss. "I'd get in the middle of a piece and forget where I was going," Atkinson said. Buehler was actually tested by Boston physicians for CTE two days before Stabler died, but apparently did not show signs of the disease. The group largely wants to honor its former teammate. But also to help understand why football players are struggling with the disease. "You wonder whether it is a senior moment," Thoms said. "I got to think it is partly from football."